There are few things I love more than a great local coffee shop. I love the ambiance, the aroma of brewing coffee, and… oh yeah, the coffee. My toddler enjoys a good coffee shop visit, too! He’s more interested in the pastries than the java—and he’s good for about 10 minutes before he starts getting rowdy and catching side-eye from the laptop crowd. So I grab my cup and we head out to play! This article is sponsored by Café On The Park, a great café with an award winning library attached! Made From Scratch, Coffee To Match. Virtually everything on the menu at Café On The Park is made on site with ingredients we select. We are best known for the pastries we bake from scratch and the local coffee we serve from the award-winning roaster “I Have a Bean”. 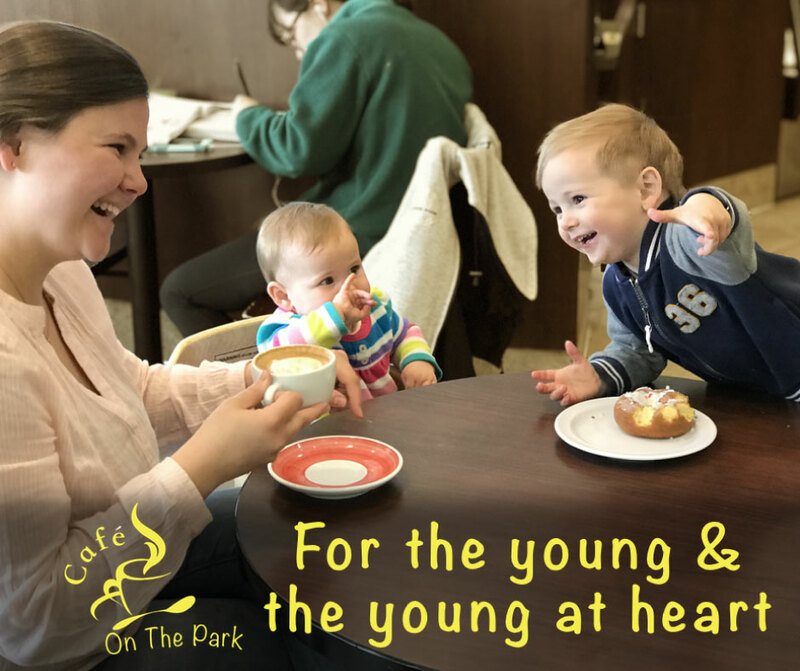 Café On The Park is a full service coffee shop that serves every type of hot or cold coffee and tea drink you’d expect along with deli style wraps, gourmet chips, 100% crushed fruit smoothies, decadent donuts, tender scones, moist muffins and giant cookies. Our outdoor patio spills right down into Adam’s Park. It’s the best place around to really relax with a cup and soak in the view far from traffic noise. The park invites young and old alike to explore the paths, play at the fountain, relax in the gazebos or just run around the wooded knolls. The café is also part of the Wheaton Public Library that offers books, play areas, story times and activities geared for all ages. Cafe on the Park is located just inside the Wheaton Public Library. Treats like scones, donuts, and even the syrups for the coffee are all made from scratch. Go during the first hour they are open and mention the “early bird special” to get half off your order! Brewpoint is not just a coffee shop, but a community space—complete with cozy seating, board games to play, and books to grab off the shelf. The shop is about a five-minute walk from Wilder Park in Elmhurst. The park itself is home to a ton of different things to do: the Elmhurst Art and Lizzadro museums, the Wilder Mansion, the Wilder Park Conservatory, a great playground, and the library—which is home to its own Brewpoint outpost, the Lexicon Cafe. When the library cafe is open, it’s the perfect place to stop and get a treat before playing! Brewed Awakening has been an anchor of downtown Westmont for more than 20 years. It’ll take you just over five minutes to walk to the playground at Veterans Memorial Park. It’s a fantastic place to play, with two different spaces for little kids and older kids. We call it the “pirate ship park” because of the huge ship-shaped play structure for younger kids! There are a few different play surfaces, including mulch, rubber, and sand. You’ll find bathrooms at the picnic shelter, too. The dramatically designed Sparrow Coffee on Water Street serves up latte art, pastries, and craft coffees that the roastery also supplies to Michelin-starred chefs. With our faces sticky from Sparrow’s macarons, my kids and I recently walked from Sparrow to the Centennial Park playground (behind Centennial Beach off the Riverwalk). This big playground has a rubbery surface, areas for big and little kids, lots of swings, and a small sand pit (love it or hate it). There’s a pavilion nearby where you can polish off your pastries or visit the bathroom. The Corner House has that laid-back coffee shop shop vibe in spades. From there, it takes about five minutes to walk to Lilacia Park, which blooms in the spring with hundreds of lilacs and thousands of tulips. There are walking paths and benches along the way. It’s also right by the Helen Plum Library, which has a children’s play area. Blackberry Market’s cafe serves gourmet foods made by hand, including a $5 kids’ menu of meals served with fresh fruit and carrot dippers. It’s a popular spot, so expect it to be a bit crowded, but the space is big. Stroll down Main Street together to the recreation center playground. It’s got ramps, slides, monkey bars, bridges, a glider, and more. There’s also a basketball court, a baseball field, and a huge open play space outside. What’s your favorite coffee shop/playground combo? Let us know in the comments! Then, check out more outdoor activities for kids. Be the first to comment on "Perfect Pairing: Local Coffee Shops with Parks Nearby"